Pablo Picasso was one of the greatest and most influential artists of the 20th century. His paintings are among the most recognizable of any great artist that has lived. 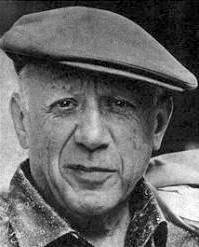 However, Picasso was not just known for his art; he was also know for his wit and pithy sayings. While reading through a collection of quotes by Picasso, it occurred to me that much of his wisdom is directly applicable to public speaking. Here are 12 quotes by Picasso with some ideas as to what we, as speakers, can learn from them. Lesson: If you want to become a better speaker, you have to speak. Seize every opportunity to get on your feet in front of others, whether it is a 45-minute corporate presentation or a 30-second toast to a colleague over lunch. It all adds up. Lesson: When it comes to presentations, computers are not useless. I am a fan of the (proper) use of slide presentation software such as Keynote and PowerPoint. (Computers were much less powerful in Picasso’s day.) However, before using the computer to design their slides, speakers should first think about their presentations: What is the objective? What should the audience do? What is the key message? Why should the audience care? Once these questions are answered, then the computer can be used (if necessary). Lesson: When preparing for a speech or presentation, it is important to gather, create and generate as many ideas as possible. But then, you have to filter those ideas down to the best ones that will support your message. The others have to go. Perhaps you will be able to use them in another presentation some day, perhaps not. Lesson: Less is more. Too many presentations break down because the speaker tries to do too much in too little time. Once your key message is 100% clear in your mind, you must focus with laser-like intensity and cut anything that does not support that message. Many of the quotes that you will find in other posts on this blog are about the importance of simplicity. That message cannot be repeated too often. Lesson: Be concrete. Use clear, simple language when you speak. Avoid the use of vague, business-speak jargon that means nothing and serves only to confuse. Say what you mean. Lesson: All speakers can improve. Some speakers—especially those just starting out—have room for improvement in many different areas. Don’t try to fix everything at once. Choose one or two areas for improvement and work on them. When you have made satisfactory progress, move on to something else. Small steps will take you far. Lesson: Always be on the lookout for interesting facts, stories and ideas that you can use in your presentations. Read widely—literature, newspapers, trade magazines, blogs, quotations. Start a file for interesting stories that you come across. Evernote is a great way to clip and store interesting things electronically. Read A Whole New Mind by Dan Pink. Get in the habit of carrying a small notebook and pen or electronic device such as a Smartphone to record great ideas that come to you whenever they come to you. Lesson: In fact, good speakers never try to copy other speakers. Good speakers know that they can only be themselves. However, good speakers are quite willing to “steal” from others. And here, I am talking about trying out something that they have learned from another speaker, or read on a blog such as this one, or learned in a course on public speaking. Nobody knows everything and we should be open to learning from others. But we should never try to be like others. Lesson: Many people have seen more than their fair share of dull presentations bursting with slides crammed with text and bullet points. Many of them believe that this is how serious presentations are supposed to be. Nothing could be farther from the truth. Refuse to give in. Some text is fine, but also use images, video, stories, props, demonstrations, audience participation and other creative ideas to make your presentation stand out. Remain an artist. Lesson: There is only one you. On stage, as in life, be yourself. Lesson: Never stop growing as a speaker. Try new things. Seek out opportunities at work to give presentations. Join a public speaking club such as Toastmasters and give speeches on a variety of topics. Take a class in improv comedy. Try to speak at a TEDx or Ignite event. Try Pecha Kucha. Stretch yourself; you’ll be surprised how far you can go. Lesson: Whether you improve as a public speaker is ultimately up to you. This entry was posted in Quotes for Public Speakers and tagged Dan Pink, Evernote, Pablo Picasso, public speaking, Public Speaking Quotations, quotations. Bookmark the permalink. Number 4 reminds me of your earlier Chopin quote. Indeed, many of these 12 seem to be universal truths that can be discerned in great achievers in a variety of disciplines. The challenge for your readership will be to translate reading these lessons (intellectual assimilation) into living these qualities (embodiment). Thanks for a thought inspiring post, John. Thanks, Ben. Indeed, Chopin’s quote was also about the importance of simplicity. The more I read, learn and live, the more I understand the importance of simplicity in many facets of life. Really great post! I very much appreciate it and definitely will share it! Thanks very much, Maria. Glad that you enjoyed the post. I appreciate your sharing it with others. This is an amazing post and you constructed 12 important points for this. Those are useful to everyone and we all know Picasso is such a great fine artist. I very much appreciate the comment, Arianne. Glad that you enjoyed the post. Best of luck for the good work you are doing with kids in Australia. Picasso wasn’t my favorite, either … until I saw his early works (pre-Cubism) at the Picasso Museum in Barcelona. Phenomenally talented while still in his early teens. If you ever wonder about his gift and ability because you’re not keen on his more famous later works, visit this museum. The portraits he created as a 15-year-old leave no doubt that he was a supernova prodigy. Thanks, George. I’ve been to the Picasso museum in Barcelona and know exactly what you mean. I’ve also been to the Picasso museums in Paris and Luzern, Switzerland. In fact, the photographic exhibition of Picasso that is based in Luzern has come to Geneva for four months so I am looking forward to seeing it again. Pingback: 7 Blocks To Creative Thinking And How To Solve Them | Self Improvement, Faith, & Confidence. Probably the most fundamental is #12 (I think this is why you put it last) as, without 12, the rest don’t matter. Indeed, Seb. I played around with the order of the quotes, but the one that ended up as No. 12 seemed to me to be the most fitting one with which to end. Thanks, Conor. Much appreciated! Picasso was great. I have been to the Picasso Museums in Paris, Barcelona and Luzern, and this summer, when we were in Toronto, the Art Gallery of Ontario had a wonderful Picasso exhibition. I never tire of him.